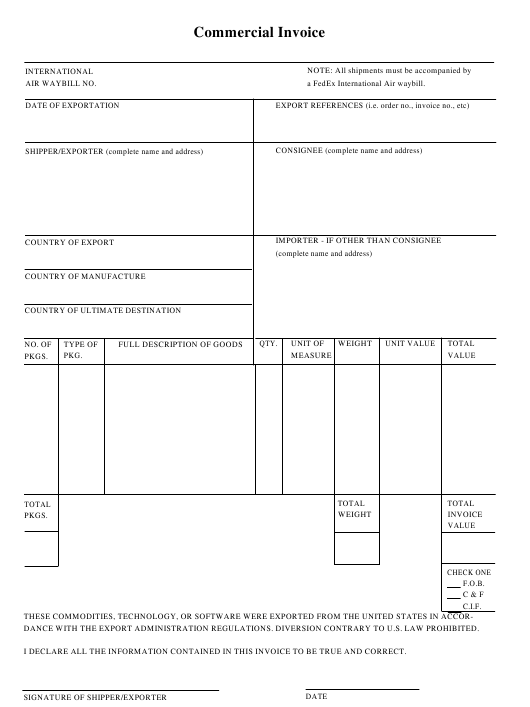 a FedEx International Air waybill. DANCE WITH THE EXPORT ADMINISTRATION REGULATIONS. DIVERSION CONTRARY TO U.S. LAW PROHIBITED. I DECLARE ALL THE INFORMATION CONTAINED IN THIS INVOICE TO BE TRUE AND CORRECT. 1. International air waybill number. 4. Complete name and address of shipper. 5. Complete name and address for the consignee. 7. Complete name and address of importer, if different from the consignee. 8. Country of manufacture of the product. 9. Country of ultimate destination. a. Any identifying marks or numbers used on the packaging. b. Total number of packages described on each line. c. Type of packaging being used: i.e., roll, tube, carton, etc. and H.S. numbers, if available. c. Quantity of items described on each line. f. Measurement unit used-lbs., kg, pieces, sets, pairs, yards etc. g. Weight of items described on each line. h. Dollar value of each unit. i. Dollar value of items described on each line. j. Dollar value of all items listed on the invoice. 11. Shipper's Declaration, signature and date. 12. One original and two copies required for FedEx shipments.